Seashell Identification – Is This a Wentletrap? 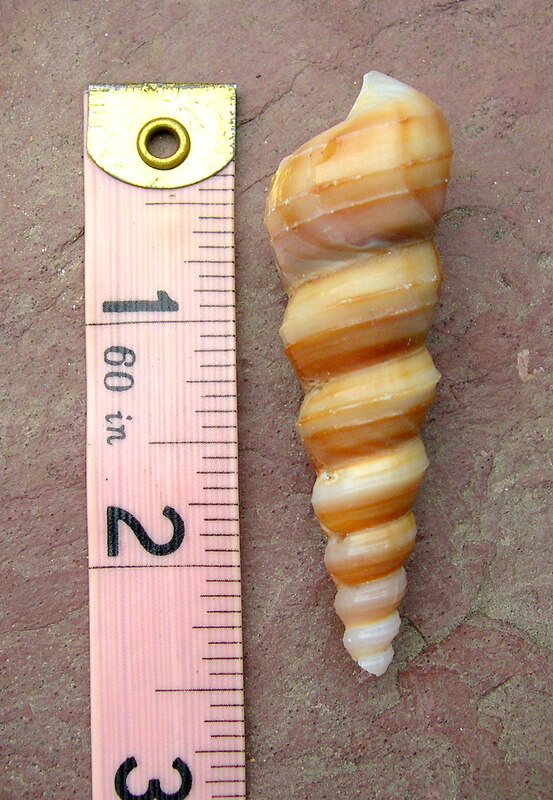 I have a long, spiral shell with golden brown markings that I found along the Florida coastline. I’m not sure if it was found on the Gulf coast or on the beaches south of Daytona. I honestly don’t remember where most of my sea treasures came from, but we headed to the east coast beaches of New Smyrna and Bethune to swim, surf and boogie board throughout the summer where we’d pick up whatever appealed to us and bring the best treasures home. I’ve also visited Sanibel Island a few times and of course found many interesting shells there as well. This one is still a bit of a mystery to me. My guide book doesn’t have a picture like it and I can’t seem to find it at the online sites either. My best guess is that this shell is some sort of a Wentletrap. However, Wentletraps have vertical ridges along each curl of the shell and this one doesn’t so that leaves me wondering. It’s 2 1/2 inches long as you can see in my photo, which is just about the size of Mitchell’s Wentletrap. If you know what it is, I’d love to hear from you. Leave a comment below. For now I’ll refer to it as a wentletrap for lack of a better name. UPDATE: flandrumhill suggested that it is a Boring Turret Shell and I think she is correct. Previous Post Sea Biscuits On Sanibel Island? I looked that one up as well and it didn’t look as similar as the Boring Turret. Even the same type of shell can have so many various looks, it’s sometimes difficult to know for sure. Thanks again. Thank you for that good info flandrumhill. I looked it up in my seashell book and I think you might be right, although mine is larger than the ones in the book, so he must be a grandpa 😉 It definitely has similar markings with those bands going in the same direction. I do appreciate your help! Any chance this might be a Boring turret shell? The ridges would at least be in the same direction.